Founded in 2008 at the Ischia Chamber Music Festival (Italy), string trio Ensemble Epomeo (Diane Pascal – violin; David Yang – viola; Kenneth Woods – cello) is fast rising to the upper echelon of international chamber groups. Inaugural tours saw them performing in Italy, the UK and the USA, with broadcasts on New England Public Radio and WKCR Columbia University in New York where they were the subject of a 3 hour special showcase concert. Ensemble Epomeo has developed vibrant collaborations with leading festivals including the Newburyport Chamber Music Festival (USA), Two Rivers Festival (England), and Scotia Festival (Canada) and they have been Ensemble-in Residence at St. Thomas University (Canada). 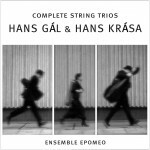 Ensemble Epomeo released their debut recording for AVIE Records in 2012 featuring the complete string trios of Hans Gál and Hans Krása. 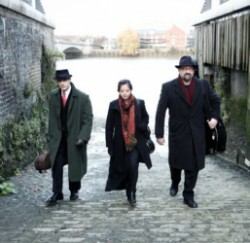 The disc is the world premiere recording of Gál’s trios, written in 1931 and 1972. 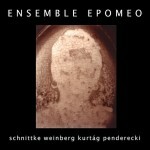 “Critic’s choice” in Gramophone Magazine (“Ensemble Epomeo provide ravishing accounts of both Gal works, fully in sympathy with the idiom…A splendid disc I cannot get enough of”), recent reviews also include the San Francisco Chronicle (“a brilliant revelation…unforgettable…superb performance”), Strad Magazine (“A warmly recorded and thought provoking disk”), and MusicWeb International (“huge commitment and brilliant flair”). Other releases include Schoenberg’s Verklarte Nacht (July 2014); a recording of 20th Century string trios by Schnittke, Pendercki, Kurtag, and Weinberg (November 2014); and a boxed set of the complete string trios of Beethoven (summer 2016). Passionate advocates for the music of our time, Ensemble Epomeo has commissioned new works by composers Jay Reise, Kamyar Mohajer, Andrew Keeling, Donald Fraser, Victoria Bond, Kile Smith, Melissa Dunphy, Kenneth Woods, Philip Sawyers, James Primosch. The trio take their name from the legendary volcano Mount Epomeo on the island of Ischia in the Bay of Naples, where they gave their debut performance in 2008 at the Ischia Chamber Music Festival performing Schnittke’s String Trio, a work with which they have become closely identified. The trio has an alter-ego for outreach concerts in children’s storytelling and music troupe Auricolae. Their first recording on the New Focus label was released in 2008: “what we have here is a children’s disc – famous stories told in an intelligent and accessible way accompanied by music created for such…one cannot but admire the commitment and educational effort that goes into such an undertaking, especially in these days when troglydyte school superintendents and their lackey boards of education are eliminating music programs…the stories are presented with energy and great panache…the playing is superb; I cannot reasonably imagine better.” (Audiophile Audition). Their second, two-disk CD, Fairy Tales, Folktales and Folklore, was be released by Avie in Spring 2014. Ensemble Epomeo has no upcoming tour dates. Please check back soon.